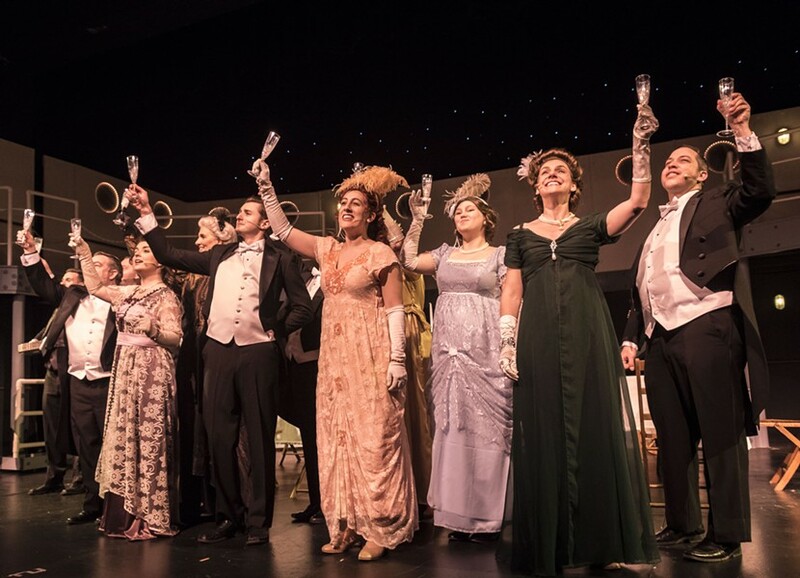 The first class passengers toast to the voyage during the JCC CenterStage production of "Titanic the Musical." The RMS Titanic, at the time the greatest ship that had ever set out across the Atlantic, collided with an iceberg on April 15, 1912. Within two hours and 40 minutes, the ocean liner sank and more than 1,500 people lost their lives in icy waters. If this feels like a spoiler, it is -- and it's safe to assume you already know this piece of history -- but "Titanic the Musical" isn't really about the ending anyway. Through May 21, the JCC CenterStage provides a unique take on an event that happened more than 100 years ago. "Titanic the Musical" opened on Broadway in 1997 and won five Tony Awards, including for Best Musical. Although it seems odd that a musical with a predictable ending and weighty content would do so well, Maury Yeston (music and lyrics) and Peter Stone (book) have managed a thoughtful, even humorous retelling of the historic tragedy. The original production of "Titanic the Musical" featured nearly 50 actors and an elaborate, three-level set, making it nearly impossible for community and regional theaters to produce their own versions. In 2012, former "Titanic" cast member Don Stephenson and choreographer Liza Gennaro developed a chamber version of the show with a stripped-down set concept and 20 actors who play multiple roles (the JCC production features 23 actors). "Titanic the Musical" especially resonates because the characters are based on true stories and events from Titanic history. The hopeful, happy songs are bittersweet in light of what's to come, and the vignettes between lovers and compatriots hold higher stakes. Because of this, it was important for co-directors Ralph Meranto and Esther Winter to showcase a cast capable of emotional and vocal range, which they achieved nicely. (The duo should also be applauded for co-directing a show that ran so seamlessly, not an easy feat for any production.) Though all 23 cast members were strong, there were a few who created standout moments. Alex Black (as Frederick Barrett and Benjamin Guggenheim) and Marc Cataldi (Harold Bride and Wallace Hartley) deliver a heartrending duet in "The Proposal / The Night Was Alive" as a third class stoker who's in love with a girl back on shore and a misfit radio operator. John Connors (First Class Steward Henry Etches and Herbert J. Pitman) and Caitlin Ruddy (Alice Beane) provide comedic relief throughout the show. Abby Rice (Kate McGowan) and Eric Schutt (Jim Farrell) have a winning chemistry as third class Irish immigrants who fall in love -- Rice's vocals on "Lady's Maid" are among the best in the two-and-a-half-hour run. As the captain of the RMS Titanic, Steven Marsocci (Capt. Edward J. Smith) plays a genuine character who reflects honor, peer pressure, and later, regret. There's not a lot of choreography, but Meranto and Winter incorporate clever, well-placed movement into the staging to project the feel of a ship. The set design by Eric Williamson and tech direction by Jerry Smith collaborate in a conceptual version of the ship, one that effectively allows for many scene changes throughout the run. Lighting design (by Toni Elderkin) and sound design (Bob Puff) are vital as well, contributing to the overall flawless technical side of a rather complicated production. Costume designer Diane Spacher should be particularly applauded for the numerous and consistently grand outfits which cast members quickly changed between, and wigmaster Laura Fox accentuates several of the costumes with Gibson Girl headpieces. The chamber version of "Titanic the Musical" places the orchestra onstage to blend with the ship's aesthetic, and Conductor Casey Filiaci deftly guides the six-person ensemble through many musical numbers and incidental pieces. Jerry Jones, a local Titanic historian who served as dramaturg and consultant on the JCC production, confirmed during Sunday's talkback that the production takes some creative license, but has many factual links (including that of one couple, the Beanes, who survived and settled in Rochester; they're buried in Mount Hope Cemetery). "Titanic the Musical" is a show for history buffs and musical theater enthusiasts alike. It's a heartbreaking, poignant story told by an impressively talented cast - and a timely reminder to live fully in every moment.